Buried: Southern Cemetery Dunedin N.Z. Cause of his death was chronic brights (kidney) and heart disease. Pastel at age 8 1851 by Sydney Buck in possession of Adrian Hopkins Vale View Marnhull Dorset 1998. Theodore appears to have been an engaging and well respected gentleman, sadly dying in his prime. The Ipswich Journal Saturday, 27 June 1846. Sponsors at Theodore's baptism were, Robert L Fenn, George Vanderzee , Isabella Vanderzee. He was educated at Merchant Taylor's School London, as was his father, being admitted 19 June 1846 son of Thomas and Maria Surgeon Nayland. Ref Merchant Taylor Admissions - The Genealogist. Nayland: Mr Theodore George Fenn 2nd son of Thomas Harrold Fenn Esq, passed examination for Masters Assistant at Royal Naval College, on 12 inst. Essex Standard Friday, 15 March 1861. Asst Masters: Theodore George Fenn to the Esk. Belfast Morning News 1 June 1863. Theodore is mentioned in a letter by his Gt. Uncle Capt. William Liveing to his daughter Elizabeth. The last two or three days have been cold . . . . . It was Bob Fenn who told me that Theodore had been to London about a Gunboat, to be not commander of her, but second in command, for any real furtherance of his future promotion and practical and scientific acquaintance with his peculiar department of his profefsion he might just as well apply for a Bumboat, Bob called on Monday . . . . .
Masters Asst - Theodore George Fenn to the Neptune. Masters Asst - Theodore George Fenn. Morning Post Thursday 28 May 1863. Navigating Sub Lt Theodore George Fenn to the Gnat at Devonport. Ref: London Standard Monday 18 May 1868. The Gnat was wrecked on a reef off the Phillipines Island of Balabac in the South China Sea on Dec 6th 1868. Lieut T G Fenn RN was serving as Navigating Officer. The Gnat was a composite screw gunvessel launched at Pembroke Dockyard (Wales?) on 26 November 1867 - see picture file. Ref A A Fenn & Wikipedia. Theodore G Fenn, Masters Asst to the Neptune. January 23 Theodore George Fenn promoted to the rank of Navigating Lieut in her Majesty's Fleet. The Times 25 January 1873. Navigating Sub Lt Theodore George Fenn to the Supply. Ref: London Standard Saturday, 20 Dec 1873. Navigating Lt Theodore George Fenn has been placed on the retired list of his rank from 20th ult. 1885 - Master mariner of Mid (Middle) Wd (Ward) P.C. Port Chalmers. 1887 - R.N. of Ann St, Roslyn, Dunedin. 1889 - Master mariner of Belle Knowes, Mornington, Dunedin. 1890 - Master mariner of Selkirk St, Roslyn, Dunedin. Lloyd's Captains Register http://www.history.ac.uk/gh/capintro.htm - an index to most of the Lloyd's Captains Registers held by the Guildhall Library Manuscripts Section. Theodore died on the 20th December 1889 aged 43 at his home at Gads Hill Littlebourne Dunedin after seven years in NZ. Flags at the Harbour, Union Steamship Co, and other offices, and of all the vessels at Dunedin and Port Chalmers were displayed half mast yesterday as a mark of respect to the late Captain Fenn who commanded the U.S.S. Coy's steamer Pukaki in the Fijian trade, and who was also for a long time Captain of the Beautiful Star. The deceased gentleman was an officer in H.M. Navy and held the rank of Navigating Lieutenant. He retired on half pay a few years back and came out to settle in NZ, taking service under the Union Coy. Captain Fenn gained many friends by his genial and kindly manner, and his death will be deplored by all who had his acquaintance. He leaves a widow and young family. The flags on the vessels in the harbour and the shipping offices were displayed at half-mast to-day, as a mark of respect to the late Captain Fenn, who commanded the Pukaki in the Fiji trade, and was for a long time captain of the Beautiful Star. Deceased had retired from the navy on half-pay, and came to New Zealand. He leaves a widow and a young family. The flags on the vessels in the harbour and the shipping offices were displayed at half-mast to-day as a mark of respect to the late Captain Fenn, who commanded the Pukaki, and was for a long time captain of the Beautiful Star. The deceased had retired from the Navy on half -pay, and came to New Zealand. He leaves a widow and a young family. The flags at the Harbour, U.S.S. Company's, and other offices, and of all the vessels at Dunedin and Port Chalmers were displayed half-mast high on Friday as a mark of respect to the late Captain Fenn, who commanded the U.S.S. Company's steamer Pukaki in the Fijian trade, and was also for a long time captain of the Beautiful Star. The deceased gentleman was, an officer in H.M. Navy, and held the rank of navigating lieutenant. He retired on half pay a few years back and came out to settle in New Zealand, taking service under the Union Company. Captain Fenn gained many friends by his genial and kindly manner, and his death will be deplored by all who had the pleasure of his acquaintance. He leaves a widow and young family. OTAGO DAILY TIMES 23 Dec 1889. FENN ; on December the 20th at Gad's Hill Littlebourne. Theodore George Fenn Lieut R.N. aged 43. 3. Census: England, 3 Apr 1881, Park Cottage Easeborne Midhurst SSX. Theodore's address was Park Cottage and he is described as Head of the family, a Naval Lieut R.N. Retired, Married, aged 54 (incorrect), born Nayland SFK. 4. Theodore George Fenn: Will, 1877. Signed by the said Theodore George Fenn the testator as and for his last Will and Testament in the presence of us both present at the same time who in his presence at his request and in the presence of each other have hereunto subscribed our names as witnesses. Solicitor of the Supreme Court of New Zealand. 5. Theodore George Fenn: Images. 6. Theodore George Fenn: Ships Theodore served on. The following vessels were in the harbour of Otago on the 21st : . . . . . Beautiful Star, 5.8., Captain Fenn ; . . . . . VESSELS IN PORT. The following vessels were in the harbour of Otago on Tuesday : At the Export Wharf. Steamers . . . . . Beautiful Star (Captain Fenn) . . . . .
Before the Waihora arrived in port from Sydney yesterday, Captain Fenn, who is in command of the vessel while Captain Popham is taking a holiday, was made the recipient of an address from the saloon passengers, who desired to testify their appreciation of his courtesy and kindness on the voyage across. The presentation was made by Mr. A. R. Guinness, M.H.R., and after several other passengers had given expression to their feelings, Captain Fenn's health was drunk with musical honours. A sum of money was collected in the saloon for the purpose of purchasing a souvenir for presentation to the genial skipper on the vessel's return from the South. Just before we went to press this afternoon Captain Fenn, who is in charge of the Waihora during the absence on leave of Captain Popham, was presented with a beautiful gold locket as a mark of the esteem in which he is held by the saloon passengers who came from Sydney last trip. The locket, which was made by Mr King, of Cuba Street, has an excellent representation of the Waihora on one cover, and on the other is neatly engraved the following inscription: " Presented by the saloon passengers, as a mark of esteem, to Capt. T. G. Fenn, s.s. Waihora, Sydney to Wellington, Dec, 1888." The rules of the Union Steam Ship Company prevent any of their officers receiving public presents without the direct permission of the directors, and as this has not been obtained by the saloon passengers by the Waihora on her last trip from Sydney a hitch has occurred in presenting Captain Fenn with the gold locket subscribed for by them. The subscribers intend to make the necessary application to the directors at once, and if permission is received the presentation will be made on the Waihora's return from Sydney. It will be remembered that some time ago a presentation to Captain Fenn, of the Waihora by a number of passengers from Sydney was interrupted by the discovery that it was against the rules of the Union Company. We learn that the consent of the managing director has now been obtained to the presentation being made, and the gift- a handsome gold locket- has been sent to Dunedin to be handed to Captain Fenn. The steamer Pukaki, which arrived at Lyttelton from Newcastle on Friday, is in command of Captain Andrew Anderson, who has for some considerable time occupied the position of chief officer on board. Captain Fielding, who was in command when the vessel left on her last voyage, received instructions when in Sydney to proceed to Melbourne to take charge of the steamer Fijian, Captain Fenn being unwell. 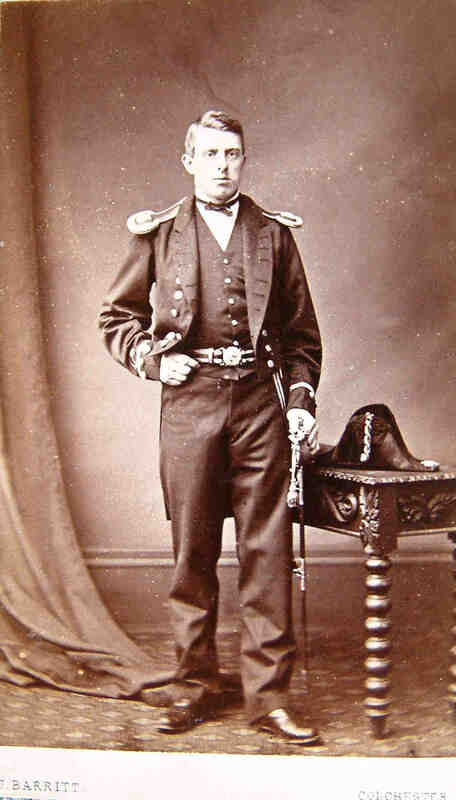 Owing to indisposition, Captain Fenn, of the s s. Pukaki, has been temporarily relieved by Captain Oliver, of the Mawhera, and Captain Dawson, late of the Maitai, fills the latter's position on the Mawhera. 7. Theodore George Fenn: Grave in Dunedin NZ Southern Cemetery. Dunedin NZ Southern Cemetery Records: 702. Book: Capt. T. George FENN. Jan 1887. Roslyn. Two burials. Stone 1: I.L.M.O. Theodore George FENN R.N. d. 20 Dec 1889 aged 43. "So he bringeth them unto their desired haven." Stone 2: I.L.M.O. Alan Playford FENN who d. 10 Jan 1887 aged 3 years 3 months. The youngest is this day with our father." Site: 1st stone. White marble base secure, cross fallen.